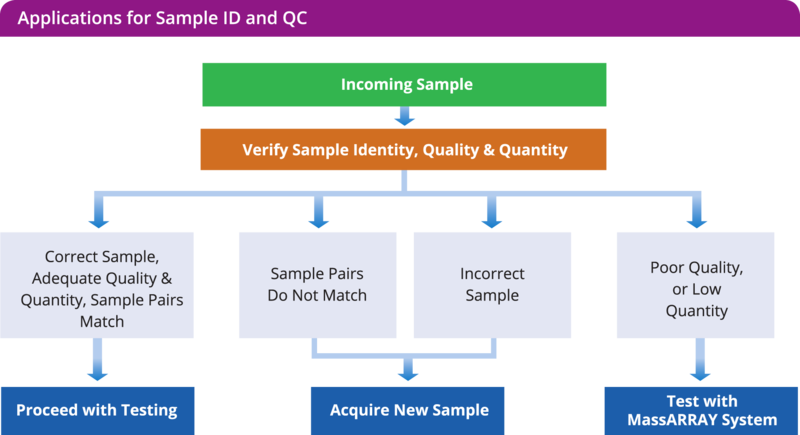 It’s estimated that 1 in every 200 samples are incorrectly identified. Many of these mistakes originate outside the lab and traditional quality checks are not enough to detect them. Reporting incorrect results negatively affects patient care and can result in litigation. DNA quality causes problems as well. Even after quantifying the DNA up front, a high percentage of NGS samples still fail. Performing complex NGS genetic analysis on samples destined to fail is a significant waste of time and money. Develop custom solutions to track samples through your laboratory’s workflow using a SNP-based barcode. Prevent costly sample failures due to insufficient quality and quantity by assessing DNA degradation and the number of available amplifiable copies, simultaneously. Utilize pre-designed assays to assess DNA quality across a broad dynamic range of 100 – 100,000 (0.3 ng – 300 ng) amplifiable template copies and 100bp – 500bp size. Apply powerful algorithms to match sample pairs such as tumor and normal tissue, as well as multiple samples acquired from the same individual at different times. Generate DNA degradation curves to estimate amplifiable DNA template at 100 bp–500bp. A highly accurate and rapid method for sample identification and quantification.